Most indoor cat people would agree the only bad part about having sweet kitties in the house is cleaning the litter box. It’s a smelly, messy, unpleasant job that has to be done regularly to keep your cat healthy. But, there is a way to make the task less dreadful. 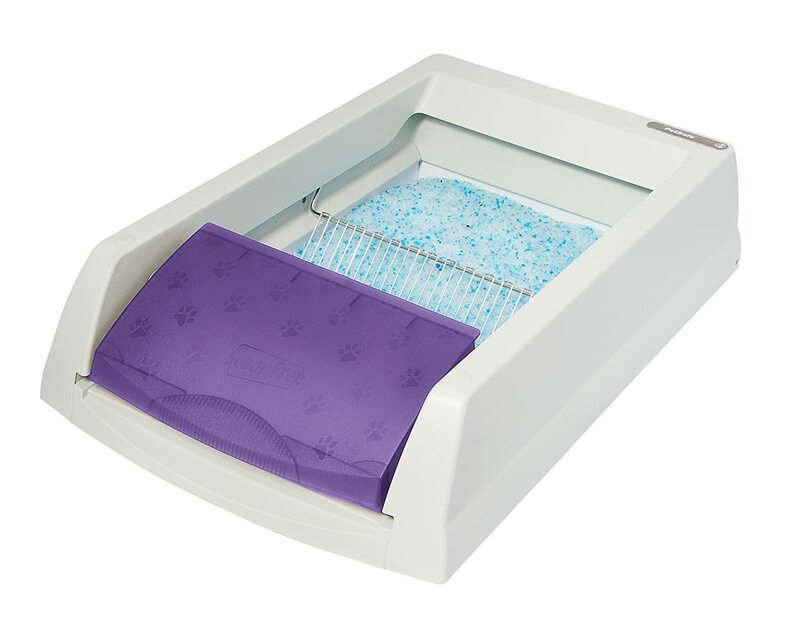 We have put together a list of five of the best automatic litter boxes available. These machines will help make the chore of cleaning up after your kitty easy and quick. ScoopFree has developed an innovative, automatic litter box that they claim stays fresh and clean for weeks without scooping. A rake pushes waste through the special odor-absorbing litter to a covered container. It stays trapped there until time to change the container. The unit automatically starts the rake action 20 minutes after your cat leaves the litter box. During that time, the special crystal litter begins dehydrating solid waste and urine for a cleaner disposal. When it is time to change the litter tray and waste trap, simply replace with new ones. No scooping, cleaning, or refilling. Fresh litter tray and waste trap lasts for weeks. Crystal litter provides five times more odor control than clay or clumping litters. Crystals are low-tracking and 99% dust-free. Also available with privacy hood in ScoopFree Ultra Self-Cleaning Litter Box. PROS: ScoopFree Self-Cleaning Litter Box provides excellent odor control . Many people report smelling no aroma from the litter box for an entire month while using this product. Because of the crystal litter, the metal rake also stays cleaner while pushing the waste through the litter to the trap.This is a big improvement over the plastic rakes found in other automatic litter boxes. This automatic litter box’s motor is pleasantly silent while the machine is running. CONS: Environmentally speaking, the required blue crystal litter isn’t a hit with some consumers. Neither is the cardboard litter replacement pan. Both of these parts must be thrown away at the end of use and are not biodegradable. The unit may not rake the waste effectively or thoroughly into the container. Feces can become stuck to the rake and urine remains in the litter pan causing odor. These issues are caused by not using the recommended litter or by not changing the litter pan often enough. The Litter Robot Automatic Self-Cleaning Litter Box is the most popular and effective self-cleaning litter box and hence my number one recommendation. It makes cleaning and maintenance of your kitty’s box simple and infrequent. The unit works by rotating, which sifts the clean litter from the clumps of waste. The waste is deposited into the drawer on the bottom. The drawer is lined with regular kitchen trash bags or Litter Robot biodegradable liners that you simply toss out after use. The manufacturer recommends changing the waste drawer once every seven to ten days for single cat users. A light on the unit flashes when it’s time to empty the drawer. You may use your choice of clumping litter. No messy rake to clean or malfunction. Easy to set up. Add litter and plug it in. PROS: People love this litter box! The ease of cleaning and odor control are the most talked about positive aspects of the Litter Robot LRII. You might have to setup a reminder on your phone to clean the waste drawer as you can’t smell an odor coming from the unit, even after a couple of weeks of use, and you may forget to clean it. The Litter Robot saves money in the long term as it uses litter judiciously because of the way it conserves litter as it sifts out the waste. They have amazing customer service and after sales support. 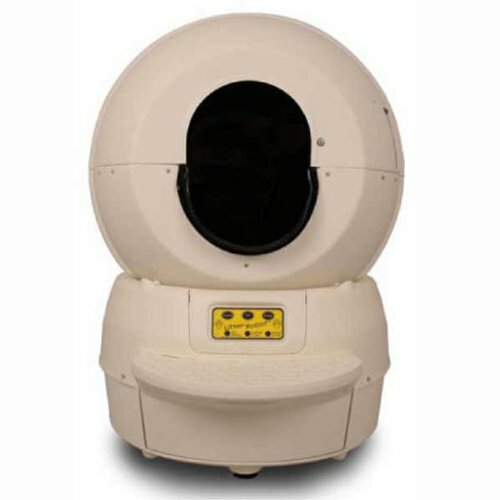 CONS: A few cats might not like the covered litter box until they get used to the Litter Robot LRII. The cost is on the pricier side although it makes up for it by saving money by being the most effective and most efficient self-cleaning litter box. The Cat Genie Self-Washing Self-Flushing Cat Box could be the most environmentally friendly cat box ever created. Because this product does not use traditional litter, but instead uses specially-formulated washable granules, there is no traditional litter to throw in the landfill. The granules are 100% dust-free, biodegradable, and septic-safe. As your cat urinates, the liquid drains through the non-absorbing washable granules. Solid waste is removed and liquefied, then disposed of down your sewer drain. The Cat Genie can be set one of three ways: to run on cat activation; to run manually; or, to run automatically up to four times per day. Flushes waste away and washes itself clean. Requires hook-up to cold water and electrical outlet. Includes biodegradable, recyclable Sani Solution cartridge and one box washable granules. PROS: Cat Genie buyers will be thrilled that they no longer have a nasty litter box to clean or waste containers to dispose of. They will also be very pleased with the cleanliness and sanitation the unit provides for their cats. The durability of the machine is excellent. The ease of setting up the litter box when compared to other auto litter boxes is a big bonus. CONS: The biodegradable crystals may get kicked out of the litter box. Cat Genie has recommended the accessory dome, sidewalls, and/or door attachment for this problem. Also, to avoid tracking, the GeniePaws mat is available to catch any granules that may cling to your cat’s paws after use. The SmartScoop Automatic Litter Box has motion sensors that activate an internal timer to begin counting down 15 minutes after your cat leaves the box. This allows time for your favorite clumping litter to work before the automatic rake assembly removes the waste into the waste tray. It is recommended to change the bag in the waste tray once per week for a single cat home. Change the bag more often in homes with multiple cats. The SmartScoop comes with a one year warranty and is a simple-to-use alternative to the more complicated automatic cat litter boxes on the market. Reliable, sturdy metal gears in drive train and a powerful motor for smooth operation. Easy disassembly for cleaning and maintenance. Litter contained in box due to raised height of side deflectors. Included: one automatic litter box; one carbon odor-absorbing zeolite filter; six no-touch waste bags. 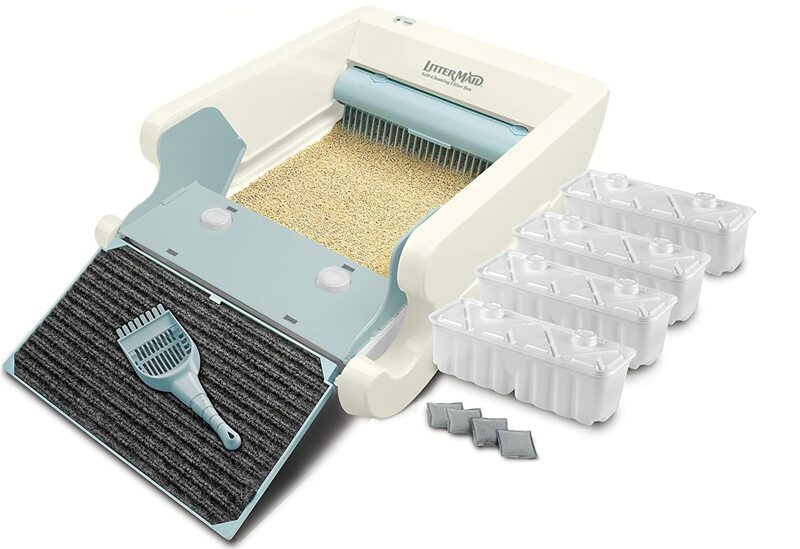 PROS: The SmartScoop Automatic Litter Box boasts a heavy duty motor which keeps the unit working over several years with multiple cats using it. Inspite of this, the machine is barely audible while running. 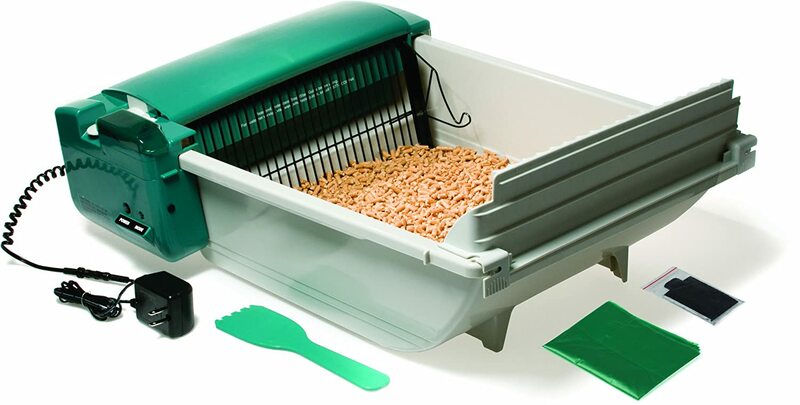 This litter box can’t be beat because of the simple design, ease of use and lack of extra, “unnecessary” features. Regular cleaning and maintaining the SmartScoop litter box is also an easy task. CONS: Larger cats may have some difficulty to fit into the litter box adequately. They might end up eliminating behind the rake where it is impossible for the waste to be removed from the box by the mechanism. 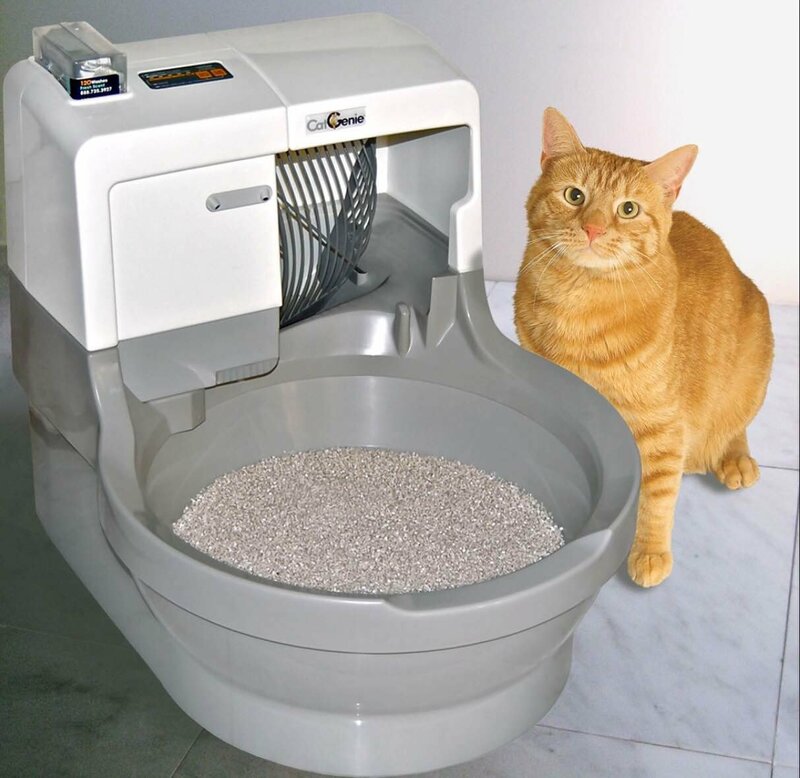 This automatic litter box from LitterMaid, the LM980 Mega, is huge. 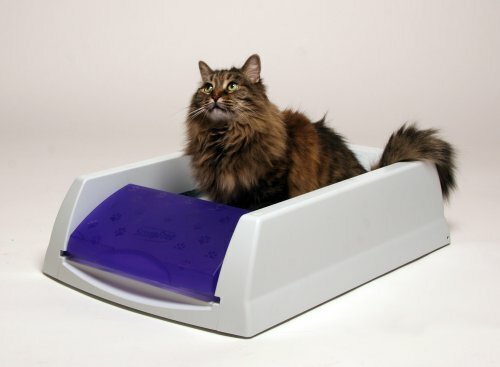 At 14” wide and 17” long, it is the largest of the five automatic litter boxes in our review. This unit is designed for cats larger than 15 pounds and/or for households with multiple cats. This LitterMaid model holds 50% more litter than their basic automatic cat box. With the high side walls, all that extra litter stays in the box. Your favorite clumping litter is compatible with this cat box. The included paw cleaning ramp keeps your cat from tracking litter away from the box. Safety bar to stop rake in case of blockage. Removable rake for easy cleaning. Includes: automatic litter box; paw cleaning ramp; four waste receptacles; four carbon filters; scoop and rake cleaner; AC adapter; battery compartment. PROS: The LM980 is quiet while it runs despite possessing a strong motor. You won’t hear it from the next room. The ease of disassembly for deep cleaning and changing the litter gets this litter box a few brownie points. LitterMaid automatic cat litter box’s durability is highly spoken of, with some users successfully using theirs for up to 10 years. CONS: You may notice the rake scoops clean litter into the waste receptacle. This is caused by using too much litter in the box. The rake sometimes does not catch all of the waste matter if the cat eliminates in one corner of the box. This problem is not a design flaw, but a consequence of where the waste is deposited. Carol C is a regular at A to Z Pet Care contributing insightful articles on dog care, products and training. She has loved animals from the time of her first childhood pet, a duck named Fluff. She’s worked as a vet tech, cow hand, and has owned a pet sitting/in-home dog boarding business for more than 30 years.